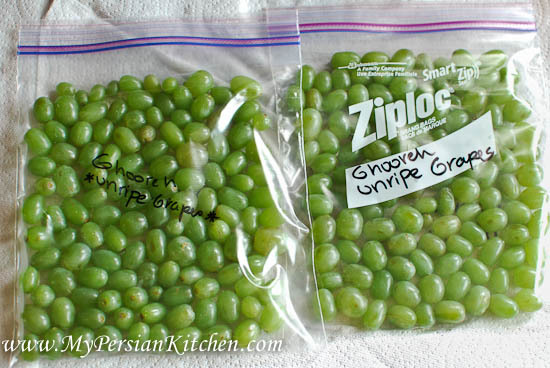 This time of the year you’ll find fresh Ghooreh, unripe grapes, at Persian stores. 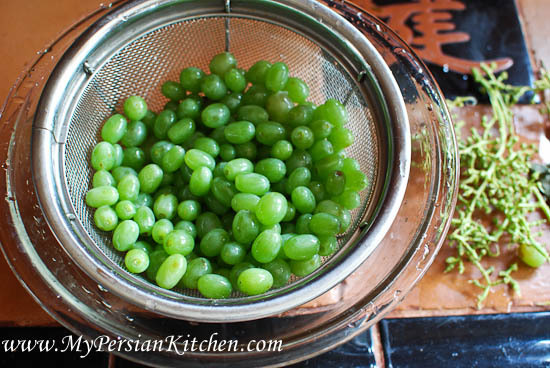 Many, who are not familiar with how Ghooreh is used in Persian cuisine, are baffled by the fact that they are sold at this stage of their ripening as they taste extremely sour. 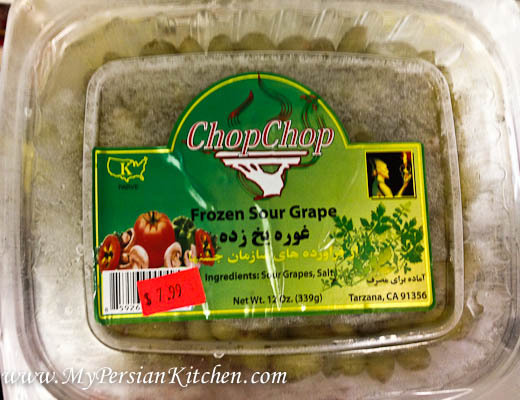 While frozen Ghooreh is generally available throughout the year, there is something very exciting about seeing available in the fresh produce section. Unripe grapes are sometimes also referred to as sour grapes. In Persian cooking they are used to add sourness to certain dishes. 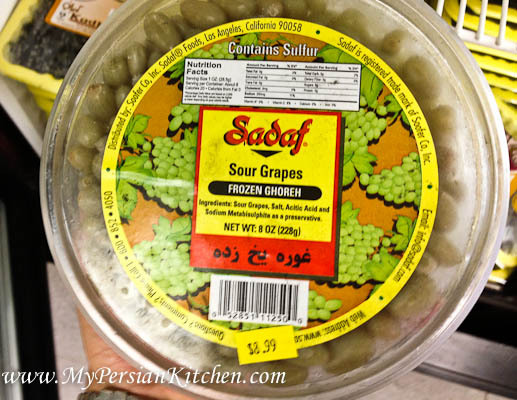 There are a few different recipes where sour grapes are use interchangeably with Dried Persian Limes. The most popular recipes where sour grapes are used are: Khoresht Bademjan (Stew with Eggplants), Khoresht Kadoo, and in the broth for Koofteh Tabrizi and/or Koofteh Berenji. 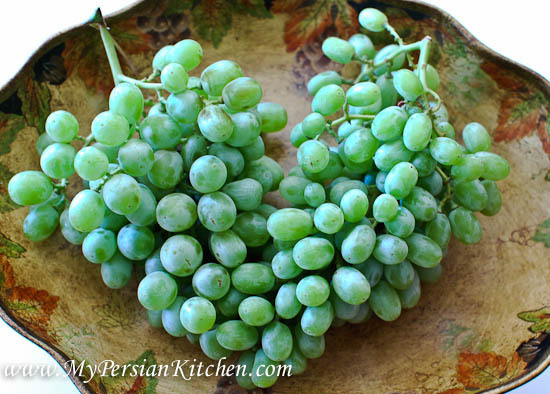 When I lived in Tehran, we had one grape vine that my grandmother specifically used to pick its grapes when they were unripe to freeze for use throughout the year. One of the reasons why I like purchasing ghooreh fresh has to do with its cost. It’s great that they are available to us at the Persian stores year round, but frankly the cost is pretty stip. 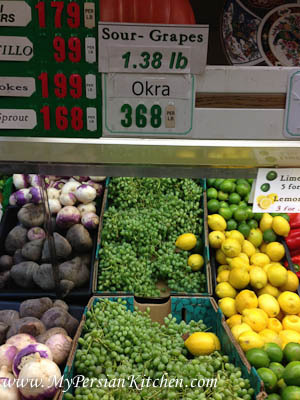 For example, I purchased one pound of fresh ghooreh for $1.38 per pound. So my total was $1.38, right? Keep that in mind! In the frozen section the brand above was $7.99 for 12 ounces. And this other brand was $8.99 for even less, 8 ounces! Needless to say I got more for my money by buying fresh! Prepping and freezing Ghooreh on your own is pretty easy. Wash grapes then remove from stems. Allow to dry completely on a paper towel. In the mean time, write Ghooreh on a freezer ziplock bag. I know I have to do that in our household as I often freeze mature grapes during the summer to have as a cooling snack! 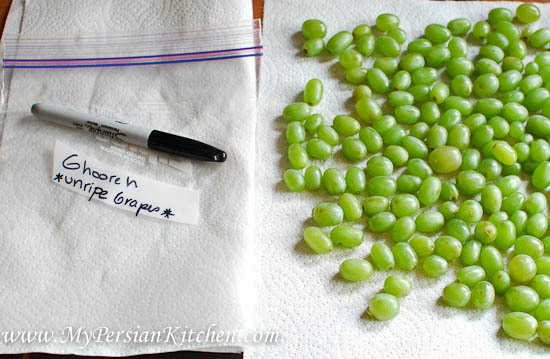 Place grapes in the ziplock bag and seal closed making sure that as much air as possible is removed. It’s best to arrange the grapes so that they are in a single layer. Place in the freezer and use as needed! I’ve never come across unripe grapes. But they sound like an interesting ingredient to experiment with. I live in Berlin, but I’ll try to buy them soon and let you know whether I managed to get them. Thank you also for simply dedicating a complete blog to persian cooking. I truly love Middle Eastern cooking (even though I’m not that good at it), and I’d love to know more about it. GREAT! Thanks for this. We’ve been wondering what to do with our unripe grapes. They never ripen here in the north of England. Usually there aren’t enough to bother with, but this year we have loads of huge bunches of them (Merlot). Your recipes sound wonderful so we’ll give the grapes a little longer (until the threat of frost) then pick, freeze and get cooking. I have a batch of unripe grapes from my garden (it is already too cold for them ripen here in northern Europe) and was wondering if I could use it in cooking. How good I found your website! Thank you for the ideas.